God does not play dice with the universe. Or maybe he does. Maybe he uses really small dice that we have difficulty noticing. If so, they might look something like these tiny dice manufactured by Iriso Seimetsu Co., Ltd. While the 100,275 yen (US$870) price tag includes a special case and the cost of shipping, it does not include the price of the microscope you will need to make sure nobody cheats at the craps table in your flea circus casino. And suddenly a slight breeze blows away your $870,- ! Finding it on a flat surface is one thing but the craps table felt would be like a jungle for these dice. More stupid objects. How about something practical? With nanotech, we'll get several orders of magnitude smaller, and it'll be made from code you download for free from the internet. Neatorama » Blog Archive » Smallest Dice in the World. aspiration. 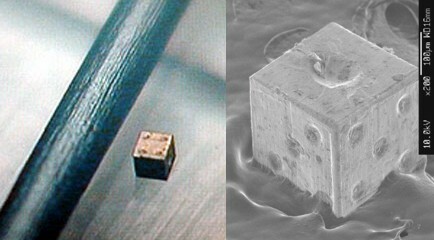 » Smallest Dice in the World. One Tired EvE Pilot » Blog Archive » OMG that is sooooooo cool.